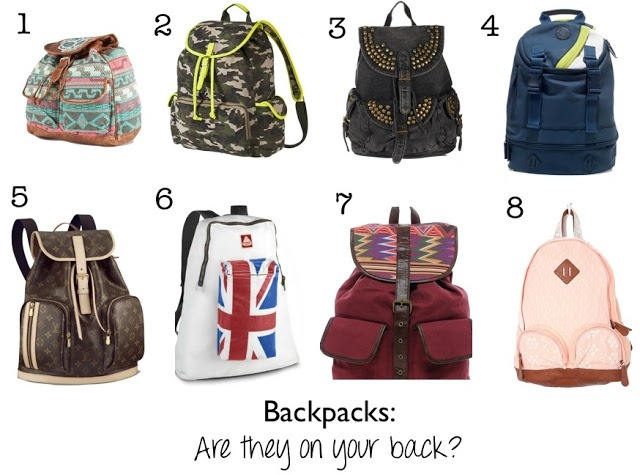 The Parlor Girl: Trendy Tuesday: Backpacks are Back?! Trendy Tuesday: Backpacks are Back?! Who is ready to throw a back pack on your back? Backpacks are everywhere lately. They sure have come a long way since the days of plain colored Jan Sports at the end of Summer. This trend seems fitting as we are in times where more and more people use alternative transportation. Whether you bike to work, ride a scooter, take BART, carpool or walk, here are a few of my favorites that cover an array of budgets. I use a Lululemon one for the gym and love how much gear it holds. Are you going to get a backpack? Do you already use one? I love #2 and of course anything louis vuitton..but that camo one is really fabulous! <3 it! I love backpacks! They are so convenient. #2 and #7 are my favorite. Backpacks are totally back...and I love it! They're so chic now, unlike those old-school L.L. Bean ones (although, I loved mine haha). LoL I forgot about the LL Bean ones ;] Too Funny!!! Love these picks. Thanks for sharing. I LOVE LOVE LOVE all these great pieces!